MS Marketing students outside Red Peg after their final presentations. Wollak pictured far left; Lamperti, center. AU student Laura Lamperti likes to challenge people's thinking. "Many things are taken at face value in the world today," she says. "I love inspiring people to look at things differently and go beyond the status quo." A recent graduate of Kogod’s MS Marketing program, her passion for creative contemplation was what ultimately motivated her to enroll. "When I see an advertisement or any type of marketing campaign, I always try to figure out the thought process behind the product," she says. "I like discovering the underlying message behind things." This semester, Lamperti channeled her intellectual curiosity into the Applied Client Project. 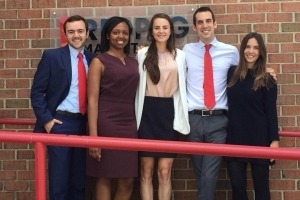 A hallmark of AU's graduate marketing program, this project provides the opportunity for student teams to design and present a full-scale marketing campaign to RedPeg, a professional marketing agency. "Working with an actual client while still in the program was incredibly valuable," Lamperti says. "Now I can walk into any job interview and feel confident that I have real-world experience." Students presented their final projects at RedPeg's headquarters in Alexandria, VA, on Friday, June 17. Each team pitched a different marketing plan for Russian Standard Vodka, to a panel of RedPeg and Russian Standard Vodka employees. A question and answer session followed each presentation, giving students the chance to receive feedback from seasoned professionals. Wollak admits the experience was not always easy. Students were expected to manage all aspects of designing the campaign, including conducting market research, evaluation of results, and strategic planning. Groups met twice a week for one semester, which presented a limited project timeline. “It was very fast-paced throughout. Completing the research and translating it into strategy in a few short months was pretty challenging,” says Wollak. The MS Marketing program also offers opportunities for career exploration through its varied coursework. Students take a combination of classes such as brand strategy, digital marketing, and nonprofit marketing, giving them the chance to study many different parts of the field. The 30-credit hour, full-time program is designed to be completed within one calendar year. "We hope the program imparts the experience and practice students need to launch or advance their careers with confidence," Clayton says. "Gaining so much insight into marketing through the client project and their classes enables students to make immediate contributions to the field, which leads to more rapid career advancements." Moving forward, Wollak and Lamperti plan to continue advancing their marketing skills outside of the classroom. Wollak is excited to begin a new marketing coordinator position this Summer; Lamperti is on the job hunt with ambitions of becoming a marketing account manager. No matter where their careers take them, it is certain the expertise they gained in the MS Marketing program has prepared them for success. The Applied Client Project, in conjunction with the program’s varied course offerings, helps shape graduates into creative, ambitious and strong marketing professionals.